They say God made the world in 7 days, 6 actually considering the 7th day God took some rest. All the plants and animals of the world from the tiny plankton to the now extinct dinosaurs were created between 5th and 6th day. The 6th day is also believed to be the day when god created man and women completing the universe. Every animal created by god is believed to be perfect and plays an important role on earth. Don’t worry this is not a lesson on mythology of the world. This is more about the imagination kids have. 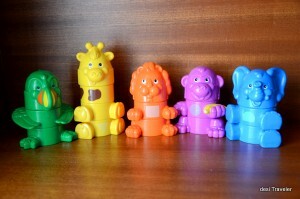 You see we have a set of modular toys of some of the animals like Giraffe, Lion, Parrot, Chimpanzee and Elephant. 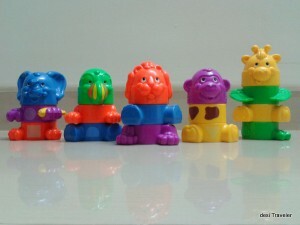 Each toy is made of 3 parts except for the Giraffe who has 4 due to his long neck. These toys are suppose to play dual role of helping kids learn about the various animals and their names but also develop their neuro-motor coordination and ability to put the right part at the right place. Soon the kiddo learned to put all the animals together based on color as well as the right place of the part and the world was perfect. Or so I thought. But then, we started noticing that she is messing up with the animals and making all kind of mistakes in placing the parts of the animals in the right place. Soon the Elephant had the hands of a chimpanzee, while the Lion had a torso of a giraffe, with wings growing out. No matter how many times we will tell the kiddo that what she has made is incorrect, she would continue to make the mistakes. This was very puzzling for us. So one day, I decided to take the matter in my own hands, aligned all the animals perfectly and took a picture of them all neatly assembled. Then, I took a printout of my creation which was an image of what god created and gave to the kiddo, with instruction that just follow this picture when you are assembling the animals. I was pretty sure she would never become an automobile engineer considering she has developed a knack for fitting parts at wrong places. Well long story short all my efforts went down the drain when we had the lion with banana in his hands, an elephant with yellow spots, a parrot who had claws of a lion and a few other combinations. I was puzzled as to how hard it could be to assemble the animals when a blueprint was right next to her. Even more puzzling was that till just a few months ago she was assembling everything perfectly. So once again I asked her to reassemble and make it like the printout, but she refused and I got what I was looking for. I was speechless; the kiddo was trying to play god and experiment with evolution simultaneously. She was not being wrong she was just being creative. But don’t they say God lives in Kids? I just smiled and left her alone.